The National Hospital Insurance Fund (NHIF) offers an array of services both inpatient and out-patient, locally and internationally. Some of the services include improved maternity care, full coverage of kidney dialysis and heart surgery costs. In addition to this, patients suffering from chronic illnesses can access medical care at almost no extra costs. NHIF thus serves as a great insurance cover to have for you and your family. You can register for the National Hospital Insurance Funds both online and offline through self-registration or visiting Huduma centre. A Kenyan resident who has attained 18 years and earns more than KES 1,000 a month and KES 12,000 per year are eligible for NHIF membership. Additionally, foreign students and foreign nationals are also eligible to apply, provided they have the necessary documents such as passport copies and work permits. In 2019, new NHIF rates were introduced with the lowest contribution being KES 150 on a monthly income of up to 5,999, and the highest being KES 1,700 on a monthly income of over KES 100,000. 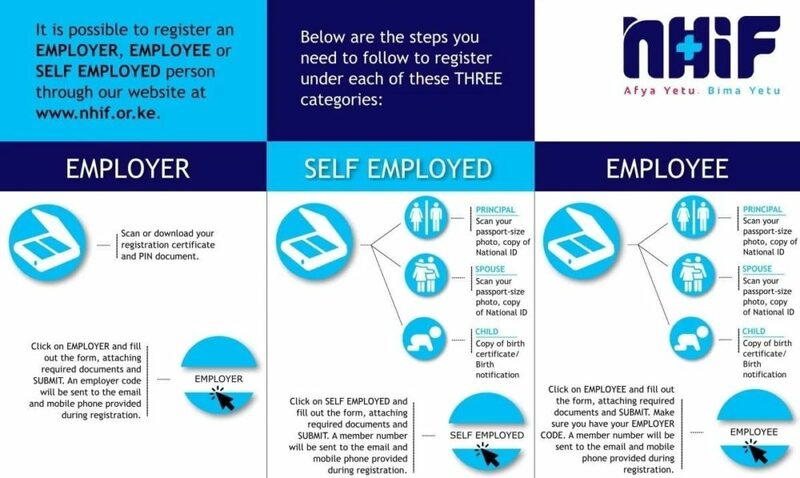 Self-employed persons will pay a monthly fee of KES 500. To read more on NHIF rates and calculations, click here. A copy of your spouse’s National ID if applicable. Original and copies of birth certificates for dependents. For employed people, a copy of the employment letter. Photocopies of alien certificate, work permit and passport. Coloured passport size photo (Spouse and dependents included if applicable). NHIF is the only insurance cover that allows you to add dependents to their cover. You can add your spouse, children or amend to remove your spouse in case of death or divorce. A copy of your ID and your spouse’s ID. A copy of your marriage certificate or sworn affidavit from the magistrate’s court. A copy of the children’s birth certificate. Birth notification for children below 6 months. Coloured passport sized photos for all dependents. Fill out the form number 26 (APPLICATION FOR AMENDMENT/UPDATES) which will be given to you at NHIF offices or Huduma centre. Alternatively, download the form here. Attach copies of the documents required in the above form. Hand over the documents to the Huduma centre officer. Checking your status is necessary so as to know your contribution status. It is important to note that late payments (payments are done after 9th of every month) attract a fine. Self-employed people will attract 50% of their monthly contribution as a penalty while employed people attract a penalty equal to the amount they pay monthly. This means that they’ll pay double. To avoid such situations, check your status via your mobile phone or online by creating an account on NHIF’s official website. 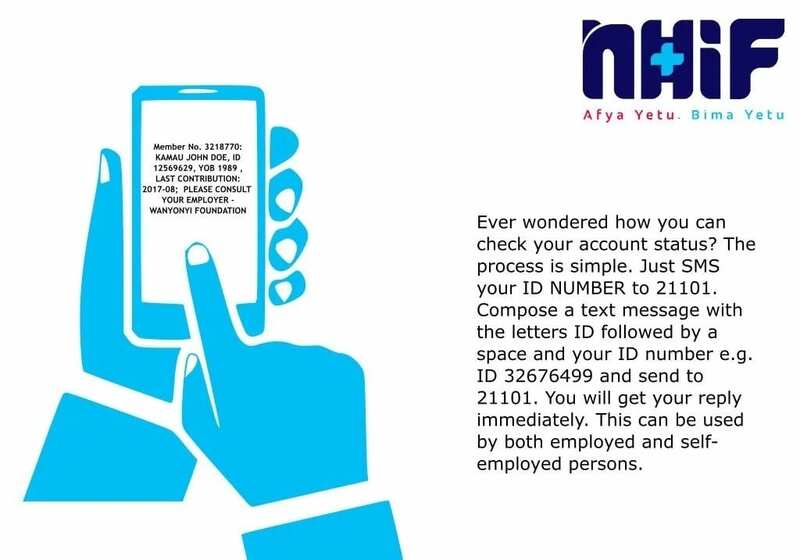 Whether you are registering for the first time or adding your dependents, NHIF is a great insurance cover to have as it is widely accepted in the country to cover medical costs from paediatric care, outpatient services and even better maternity services.